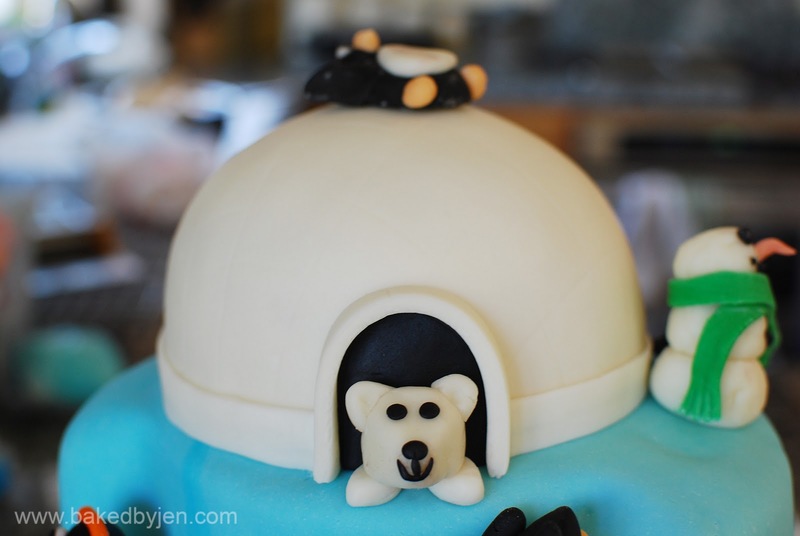 As I mentioned in my previous post, Cake4Kids held their inaugural Cake-Off4Kids Event last Saturday. There were about 50 cakes and 250 volunteers, family, friends, and supporters of Cake4Kids present to help Cake4Kids raise funds for their push to file for non profit status. Even after putting in a lot of behind the scenes work for this event, I knew I wanted to bake a cake for the competition too. This 6-8-10 tier white cake (from Baking Illustrated) with buttercream frosting covered in marshmallow fondant is my largest/heaviest/tallest cake to date. 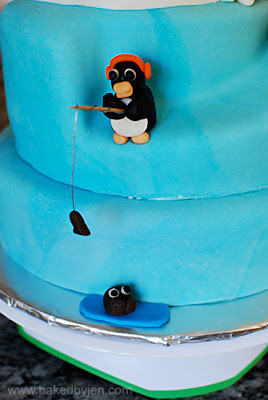 The theme was inspired by my love of penguins. I had a lot of help from my sister who made most of the fondant animals while I baked a lot of cake. I have been using A Better White Scratch Cake recipe from Cake Central for over a year now but the recipe from Baking Illustrated is my new official go to white cake. It was so light and fluffy and moist. It probably isn't ideal for stacking and carving but given the right support, you can apparently stack anything. And, in this case, I was able to carve out a portion of it for a slide. I should've done the cut all the way around but I wasn't sure how it would hold up. Also, I baked the top tier in the Wilton Sports Ball pan instead of carving it for the same reason. My 8-inch cake pans are actually 8.5 inches in diameter. 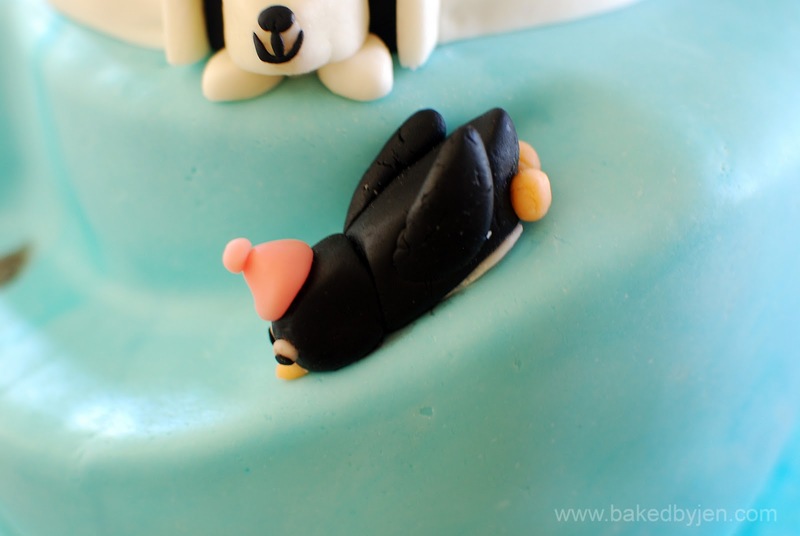 Hence, when placed on top of the 10-inch tier, there was absolutely no space to place the penguins. 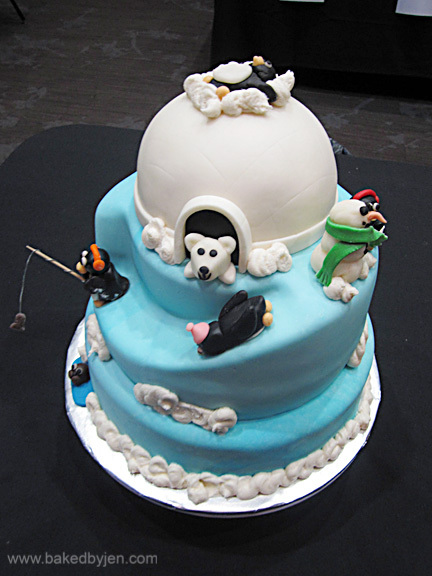 Not pictured are three of the penguins which I simply had standing around on the back of the cake instead of my planned snowball fight. 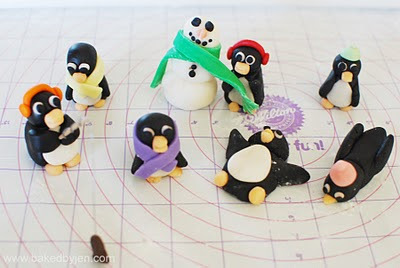 My favorite one, if I had to pick, is the penguin making snow angels! Again, due to lack of space, he had to be on top of the igloo but I think it sort of works. Transporting the cake to the location 20 minutes away was nerve wrecking. I have to thank my boyfriend for staying calm and getting us there in one piece. Taking part in this event, from start to finish, was a lot of fun; the sweetest part was winning the best decorated category!